Tyler Durden writes: Once upon a time, money – in the form of precious metals – used to be literally dug out of the earth. Limitations on the amount that could be mined, and on how much growth could be borrowed from the future (all debt is, is future consumption denied), is why eventually the world’s central bankers moved from money backed by precious metals, to “money” backed by “faith and credit”, in the process diluting both. It was the unprecedented explosion in credit money creation that resulted once money could be “printed” out of thin air that nearly destroyed the western financial system. Which brings us to Bitcoin, where currency “mining” takes place not in the earth’s crust, or in the basement of the Federal Reserve, but inside supercomputers. Bitcoins are invisible money, backed by no government, useful only as a speculative investment or online currency, but creating them commands a surprisingly hefty real-world infrastructure. Instead of swinging pickaxes, these custom-built machines, which are running an open-source Bitcoin program, perform complex algorithms 24 hours a day. If they come up with the right answers before competitors around the world do, they win a block of 25 new Bitcoins from the virtual currency’s decentralized network. The network is programmed to release 21 million coins eventually. A little more than half are already out in the world, but because the system will release Bitcoins at a progressively slower rate, the work of mining could take more than 100 years. 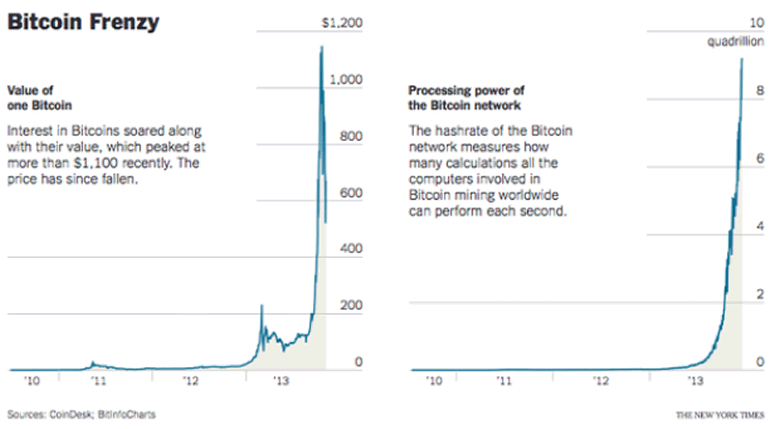 As the following chart shows, in addition to the surge in the price of Bitcoin, another explosion witnessed recently is in the processing power of the Bitcoin network: from non-existent a couple of years ago, the “mining” power dedicated to hashing, or the calculations used to extract new Bitcoins, has risen to nearly 10 quadrillion per second! So what do these supercomputer-populated mines look like? Below we look at two examples of just that. First, we look at Hong Kong, where one of the largest Bitcoin mines in the world is located. In an industrial backwater near Hong Kong’s massive port, one of Asia’s largest Bitcoin mines is quietly turning raw computing power into digital currency. Located about eight miles from the city’s finance hub, the entire facility is no larger than a two-bedroom apartment. Aside from a small bathroom, the mine offers no creature comforts. It is dominated by vertical racks that house hundreds of ASIC chips. Shorthand for application-specific integrated circuits, these chips are custom-built to mine bitcoins. Chinese investors have been enthusiastic early adopters, a trend amplified by a lack of more traditional investment vehicles in the country. Industrial bitcoin mines devote their massive amounts of computing power to working on the algorithm, and are rewarded with an equivalent share of bitcoins. Currently, a winner is rewarded with 25 bitcoins roughly every 10 minutes. Miners are lured to Hong Kong because of its proximity to chipmakers in China and the city’s permissive regulatory environment. This mine was purpose-built by Allied Control for clients based in China. Kar-Wing Lau, Allied Control’s vice president of operations, said the mine is cheaper to run and more efficient than many others because it uses a technology called immersion cooling. Heat sinks and fans are typically used to disperse the heat generated by massed ranks of computer chips, but this Hong Kong mine is liquid-cooled using a product developed by 3M. Immersion cooling allows Allied Control to leave less space between the chips, which saves money that would otherwise be spent on rent. The technology also cuts down on electricity use — one of the other major costs associated with Bitcoin mining. Lau wouldn’t reveal how much it cost to build the mine, but he said that electricity bills for a fully-operational mine of this size would typically exceed $50,000 per month. “The real question from a business perspective is how efficiently you can run your mining operation,” Lau said. Cooling, however, is only one of the key factors when determining Bitcoin “mine” placement. Another key one: access to cheap electricity, because those massive servers sure soak up a lot of electricity: electricity, whose costs can quickly add up once a parallel processing cluster gets big enough. Which brings us to Bitcoin mega-mine #2 in Iceland. It is here that the NYT goes searching for digital excavators used to procure the digital currency. On the flat lava plain of Reykjanesbaer, Iceland, near the Arctic Circle, you can find the mines of Bitcoin. To get there, you pass through a fortified gate and enter a featureless yellow building. After checking in with a guard behind bulletproof glass, you face four more security checkpoints, including a so-called man trap that allows passage only after the door behind you has shut. This brings you to the center of the operation, a fluorescent-lit room with more than 100 whirring silver computers, each in a locked cabinet and each cooled by blasts of Arctic air shot up from vents in the floor. Mr. Abiodun is one of a number of entrepreneurs who have rushed, gold-fever style, into large-scale Bitcoin mining operations in just the last few months. All of these people are making enormous bets that Bitcoin will not collapse, as it has threatened to do several times. The computers that do the work eat up so much energy that electricity costs can be the deciding factor in profitability. There are Bitcoin mining installations in Hong Kong and Washington State, among other places, but Mr. Abiodun chose Iceland, where geothermal and hydroelectric energy are plentiful and cheap. And the arctic air is free and piped in to cool the machines, which often overheat when they are pushed to the outer limits of their computing capacity. The operation can baffle even those entrusted with its care. Helgi Helgason, a burly, bald Icelandic man who oversees the data center that houses the machines, said that when he first heard that a Bitcoin mining operation was moving in he expected something very different. “I thought we’d bring in machines and put bags behind them and the coins would fall into them,” said Mr. Helgason, with a laugh. No coins, but the cash miners get in exchange for BTC, especially if each Bitcoin continues to trade close to $1000, the mining can be quite lucrative. The flipside, however, is that the business is just as if not more capital intensive than running a gold mine for the same profit. Until just a few months ago, most Bitcoin mining was done on the home computers of digital-money fanatics. But as the value of a single Bitcoin skyrocketed over the last few months, the competition for new coins set off a race that quickly turned mining into an industrial enterprise. The work the computers do is akin to guessing at a lottery number. The faster the computers run, the better chance of guessing that right number and winning valuable coins. So mining entrepreneurs are buying chips and computers designed specifically — and only — for this work. The machines in Iceland are worth about $20,000 each on the open market. In February, Mr. Abiodun used the investors’ money to buy machines from a start-up dedicated solely to manufacturing specialized mining computers. The competition for those computers is so intense that he had to pay for them and wait for delivery. When the delays became lengthy, however, he went on eBay and paid $130,000 for two high-powered machines, which he set up in June in a data center in Kansas City, Kan. This was the beginning of Mr. Abiodun’s company, Cloud Hashing, which rents out computing power to people who want to mine without buying computers themselves. The term hashing refers to the repetitive code guessing that miners do. Today, all of the machines dedicated to mining Bitcoin have a computing power about 4,500 times the capacity of the United States government’s mightiest supercomputer, the IBM Sequoia, according to calculations done by Michael B. Taylor, a professor at the University of California, San Diego. The computing capacity of the Bitcoin network has grown by around 30,000 percent since the beginning of the year. What is the upside of mining? At the end of each day, the spoils are divided up and sent to Cloud Hashing’s customers. Last Wednesday, for example, the entire operation unlocked 225 Bitcoins, valued at around $160,000 at recent prices. Cloud Hashing keeps about 20 percent of the capacity for its own mining. Some Cloud Hashing customers have also complained on Internet forums that it can be hard to get a response from the company when something goes wrong. But this has not stopped new contracts from pouring in. Cloud Hashing now has 4,500 customers, up from 1,000 in September. Mr. Abiodun acknowledges that the company has not been prepared to deal with its rapid growth. He said he had used $4 million raised from two angel investors to add customer service representatives to offices in Austin, Tex., and London. Cloud Hashing is now preparing to open a mining facility in a data center near Dallas, which will hold more than $3 million worth of new machines being produced by CoinTerra, a Texas start-up run by a former Samsung chip designer. The higher energy costs — and required air-conditioning — in Texas are worth it for Mr. Abiodun. He wants his operation to be widely distributed in case of power shortages or regulatory issues in one location. But he is also expanding his Icelandic operation, shipping in about 66 machines that have been running for the last few months near their manufacturer in Ukraine. Mr. Abiodun said that by February, he hopes to have about 15 percent of the entire computing power of the Bitcoin network, significantly more than any other operation. Hopefully Bitcoin will still be around by then. The future of Bitcoin mining is uncertain. There are a fixed number of bitcoins available — and more than half have already been extracted. Kar-Wing Lau of the Hong Kong-based Allied Control, compared the explosion of professional mining operations to an arms race. For now, it appears to be a profitable endeavor. Lau said that Allied Control is currently exploring other mining platforms, including a mine built in a shipping container — something that could prove useful if regulators crack down on the currency. Reprinted with permission from ZeroHedge.com.